Create a few Pi Day smiles while solving 2-step equations with this practice designed for 7th or 8th grade students comfortable with negative numbers. Pi Day themed answer message spices up regular practice and makes grading a snap! 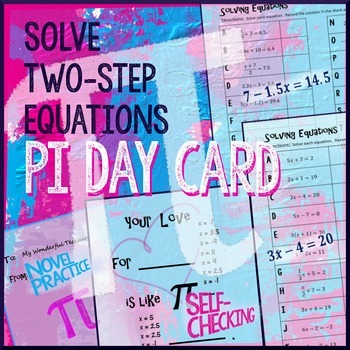 Students solve 15 equations (out of 26) before receiving a Pi Day Card. Students use answers to decode the hidden message. 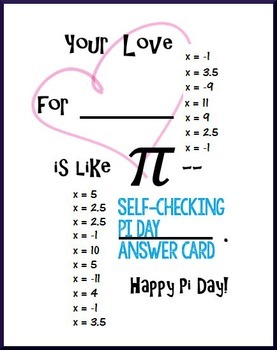 Since the Pi Day Card is addressed “To My Wonderful Teacher,” students are essentially sending you, the teacher, the card when they turn in their work. “Oh what thoughtful students I have!” Four corny or snarky messages discourage cheating. Practice solving 2-step equations, px+q=r or p(x+q)=r. 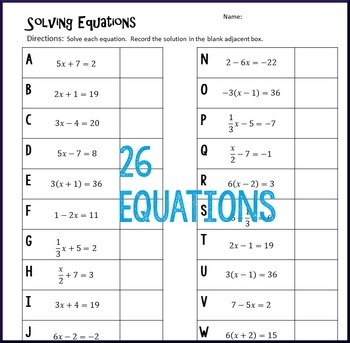 Find two versions of this activity, each with 26 2-step equations. One version primarily uses integers. 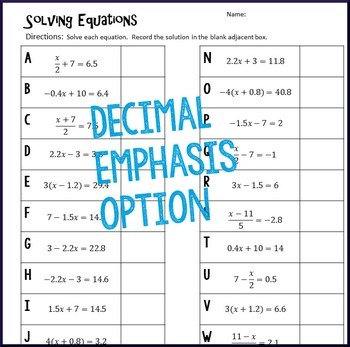 The second version focuses on equations with decimals. Easily differentiate and meet the needs of a mixed ability class by using both versions simultaneously. Note: Problems are identical to other holiday themed 2-step Equation Practices found in my store.